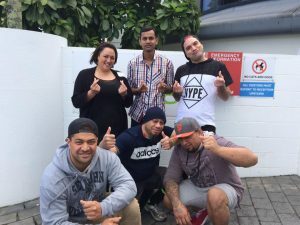 Goodman Fielder has always been passionate about developing and growing their staff – and for the last three years, they’ve been walking the talk by working with Upskills. Taking advantage of government funding for workplace literacy, Goodman Fielder has put hundreds of their staff through our workplace literacy and emerging leaders courses. Of these students, there’s one who stands out above the others – Michael Malloy. Things weren’t always so bright for Michael – after working for Quality Bakers (one of the Goodman Fielder brands) for a few years, things had started to stagnate. “I was actually getting quite bored working on the floor, doing the same thing every day,” remembers Michael, “So I went to my Plant Supervisor and told him ‘Look, I’m idling a bit, I really want to advance myself in the company.’” However, Michael’s desire to advance didn’t immediately show dividends, being overlooked for some key roles at work. His Plant Supervisor, Saurabh, remembers the day, two years ago, when Michael entered his office, visibly upset. “He asked why he wasn’t chosen for the most recent apprenticeship intake,” Saurabh recalls. “He was clearly very stressed and frustrated by the news.” New to the business, Saurabh probed with a few questions, asking Michael to brainstorm potential reasons why he wasn’t chosen. After plenty of discussion, Saurabh and Michael got to the heart of the issue. Michael knew that he had issues with his communication, which could often come across to co-workers and managers as an ‘attitude’. This image was holding him back from moving forward in his career, and he’d had enough. He wanted to do more with his career, and no longer be limited by the skills he was lacking. Following his missed opportunity for an apprenticeship, Michael turned over a new leaf. Despite the difficult conversation, Saurabh had been impressed with Michael’s desire to change. “I saw a young man who was willing to offer the world, in return for some coaching/training.” For Michael, his motivation was clear – to be a role-model to his two kids, and not work the same job his whole career. As Saurabh could see, Michael’s intentions were admirable, and it would be a shame for Quality Bakers to lose an employee with such potential. All that lacked was the skill set needed to put these into action. Michael was clear in his goal to be a better leader, and this shone through in his interactions with classmates and tutors at Upskills. “Michael had opinions on everything, and he wasn’t shy about bringing those forward,” Lynne emphasised, “His interactions brought a realness to the learning environment, that everyone benefited from.” Ultimately, Michael really engaged with the opportunity to learn leadership and communication skills, gaining a skill set which would enable him to further his career. From Michael’s point of view, the time he spent with his Upskills group was fantastic, describing the weekly courses as “like a group of friends getting together for a purpose.” Both enjoyable and informative, Michael was now better positioned to improve his standing at work thanks to the Upskills courses he participated in. 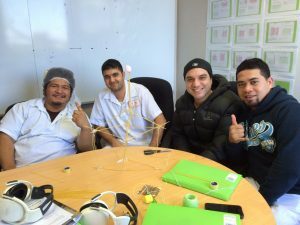 Michael (second from right) developed his people and leadership skills throughout the course as well as building key relationships with his colleagues. Looking back on his development, Michael accredits his step up and career opportunities to the new skills he’s learnt. From someone who would easily lose his cool and rub people the wrong way with his communication, to the guy that can be relied on when times are difficult, he is now able to run meetings and command the presence of a room. Prior to taking part in the Upskills courses, “you would have never gotten me up to do public speaking,” Michael laughs, but now he’s being specifically called upon to give presentations to his colleagues – even travelling as far as Australia to talk. Now, Michael is the role model he’s always wanted to be to his workmates and – more importantly to him – to his kids.